Interesting day. Weather was clear to cloudy, so much better than yesterday. I decided to try going the west-side construction route hoping to see some of the grizzlies in that area, but there were none. The road is much better than last October, when it was so rough, you could hardly stand to drive it. Now much of it is at least on road base and not nearly so bumpy. Stopped at Sheepeater and just saw a golden mantled squirrel. I had heard there had been marmots there, but I didn't see any. A few elk at Mammoth. Finally something worthwhile just north and east of the Petrified drive. 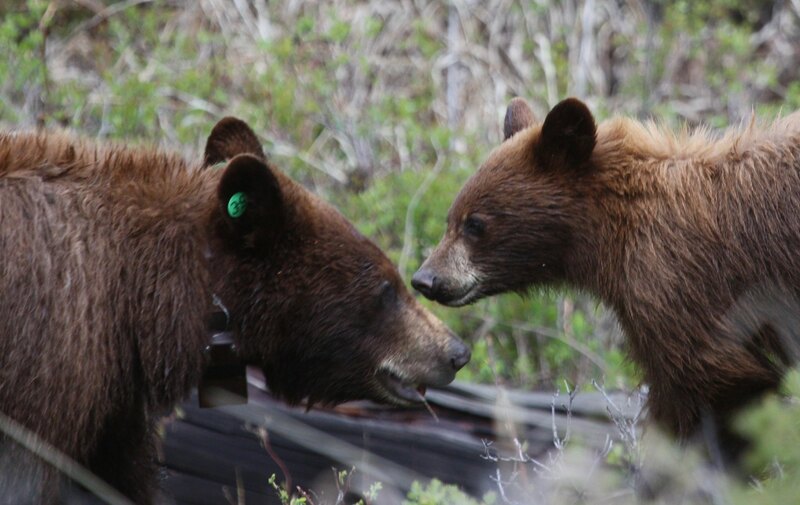 A dark cinnamon sow with collar and two ear tags was wandering around with her yearling cub. Got some halfway decent shots. 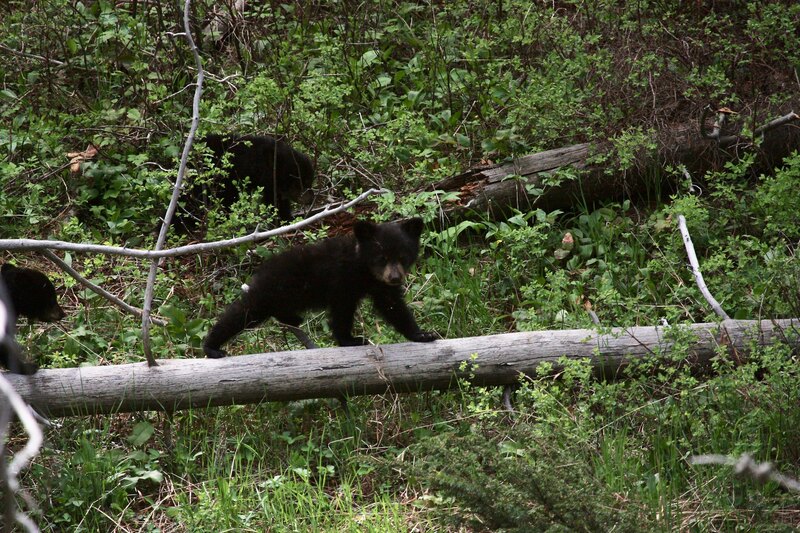 Someone later told me there was a black bear (black in color) in the same area, also with a collar and two ear tags. 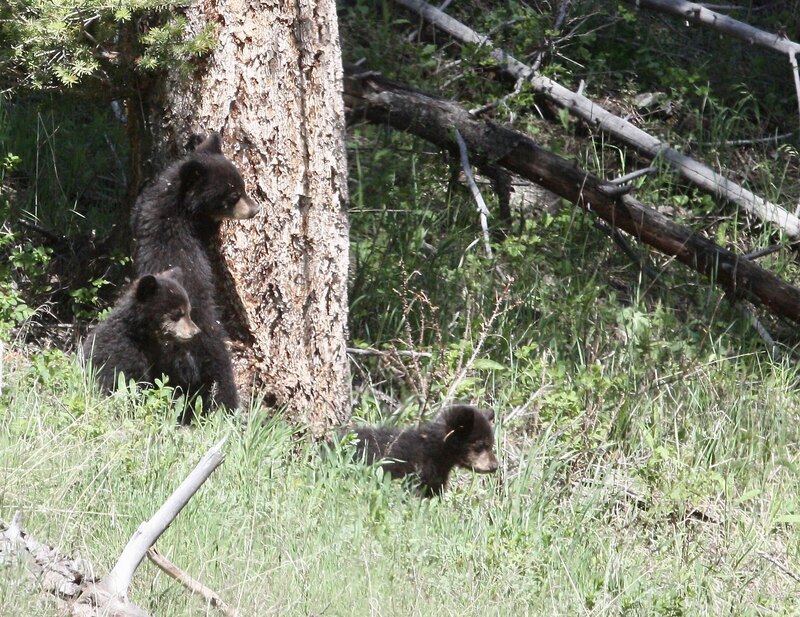 The Calcite sow and cub were sleeping in the trees down below the road, could only see an ear. 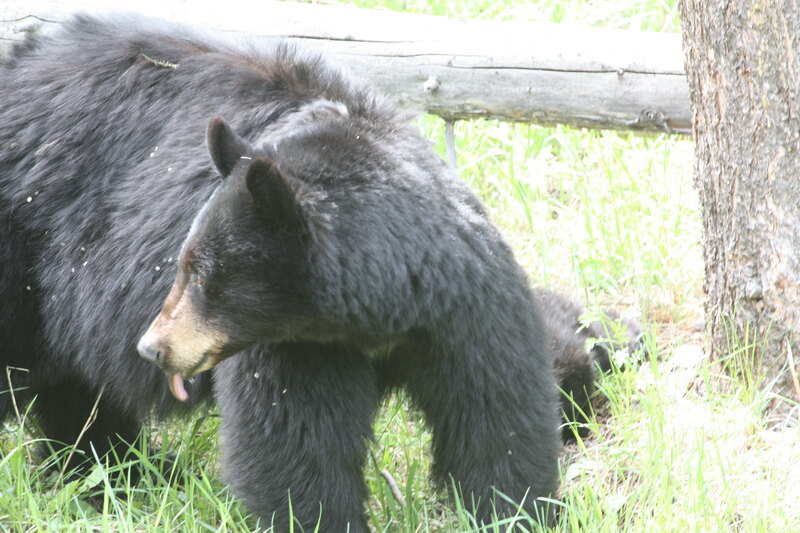 A black bear was wandering in the area where New Rosie had been Tuesday, but we couldn't see any cubs, so not sure if it was her. Back at the ranger station there was a black bear too far for decent pix for me. Went toward Lamar and found a fox in the area at Roosevelt where the wagons and trail rides take off. It kept partly hidden in sagebrush. Some young bighorns across from the picnic area. At the entrance to Slough there were 25 or more cars parked everywhere. At least one guy had a scope on some bighorns sparring at the very top ridge in the mountains, miles away. Someone also said they saw a grizzly in their scope. 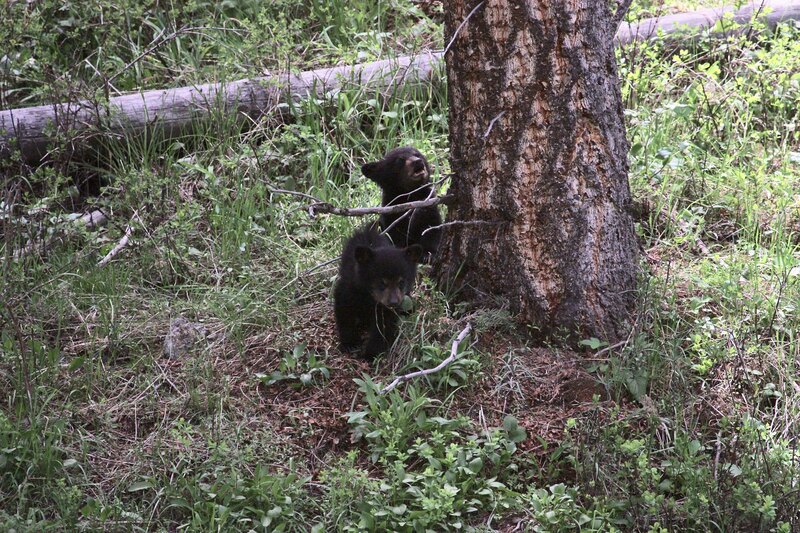 Went back to Rainy Lake and found Rosie grazing on the far side of the lake with the cubs up a tree. Found Connie there, and we stood for maybe two hours. The cubs finally came down, and they were so cute playing, Rosie even played with the feistiest one, but it was kind of far away and low light. Some of my pix aren't really terrible. It was getting late, so I headed back toward our motel amid a heavy rainstorm from Tower store to the west side. Just east of Seven-Mile Bridge there was a big crowd of people parking badly, leaving their cars halfway in the road and all. I didn't have time to stop and couldn't see anything but found out later it was probably a grizzly with two cubs I heard about a couple of times today. Last edited by lah on Fri Jun 01, 2018 10:19 pm, edited 5 times in total. Many thanks for posting such a super report, Linda. It was very, very helpful. And, as for your pix, IMO, they get better and better with each passing year. Considering all the rain and lousy weather we've had lately, I'm surprised that you were able to photograph anything. So please don't be too hard on yourself or worry about your image quality. Sounds to me like you had a great trip and were quite successful at finding critters. That's what matters. Heck, I've had some years when I never even saw a bear. So don't worry about the quality of your images...Most of us have all been there before....trying to get decent pix while fighting the rain, thunderstorms, wind and low light. Personally, I can't wait to see your pix.. The cubs sound really cute. Hope you'll be posting some pix soon! What a great report! Thanks so much for sharing. I know the feeling of figuring my photos aren't all that good -- sometimes I'm right, sometimes they are better than I thought, but the biggest thing is that you actually saw these animals and experienced that! The photos will always be good enough because YOU took them of something YOU saw and experienced. And I'm with yellvet on this -- you do better than you think. I love your photos and am looking forward to seeing them, but more than that, I'm SO glad you took the time to tell us all about your experiences and that you saw so many great things. Hope our upcoming trip is as fruitful as yours! One thing for sure -- we seldom get over to the western side of the park, since we tend to stay up in Gardiner, but I think we'll make a trip over that direction, what with all the things you saw there. Thanks! And have a safe rest of your trip. Well, thanks very much. Sometimes I get lucky. Usually I get blurry! But, yes, it's been a fun trip despite all the rain and snow and stuff. Today it was clear to partly cloudy all day, just a few little sprinkles. Yellvet, I didn't actually see the grizzlies on the west side of the park this year, I just heard that they'd just been there. 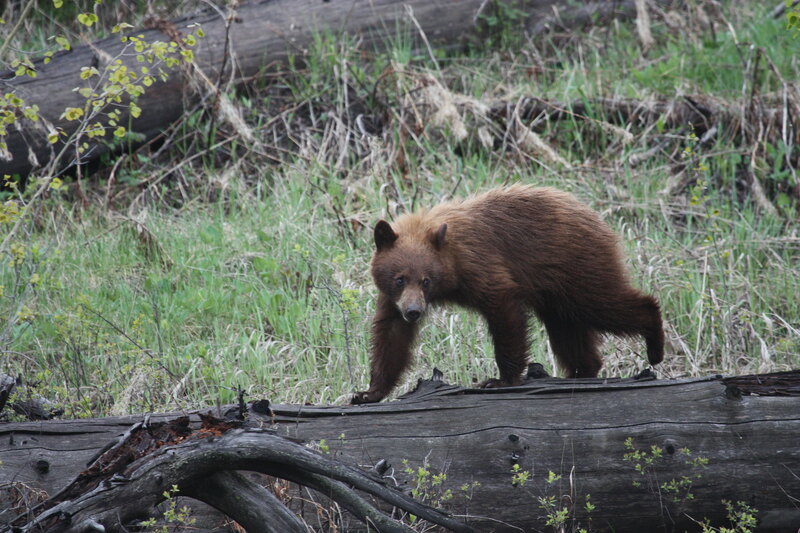 Heard today that there was a grizz with two cubs somewhere around the construction. Can't say for sure though. The construction area is one of my best places for grizzlies most years.